We’ve always said ‘to get the to heart of a culture, you’ve got to start with the stomach’! Culture and cuisine go hand-in-hand, and sampling local delicacies is one of the best ways to truly immerse yourself in the history and tradition of a given destination. 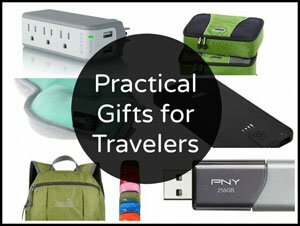 It is also something you take with you as you replicate dishes and drinks you tasted abroad once you get back home. During a recent visit to Costa Brava, Spain we got a taste of the local flavors by indulging in delicious and traditional Catalan food and drink in a variety of settings. During a recent visit to Costa Brava, Spain, we visited the capital city of Girona. We took a stroll through the Old Quarter (Barri Vell) and participated in the most wonderful cooking class where we prepared a variety of traditional Catalan dishes. 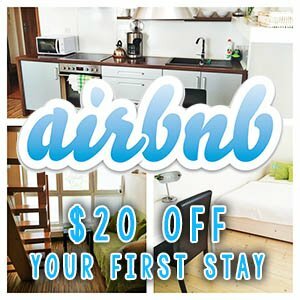 Tots a Taula is located in a beautifully restored historic ‘casa obrera’ (worker house) in Girona’s expansion quarter. Complete with a well-equipped kitchen, private dining area, open-air terrace, and flourishing garden, the space is elegantly arranged to host a variety of cooking classes and workshops. We asked the founder, Xavier, the meaning behind the name Tots a Taula and were delighted to learn that it translates to ‘all of you/everyone to the table’. What a wonderful and welcoming mantra, as food truly does bring people together! We spent a delightful afternoon with Xavier learning about and creating several Catalan specialties, like crema catalana and biscotti (carquinyolis) pictured above. 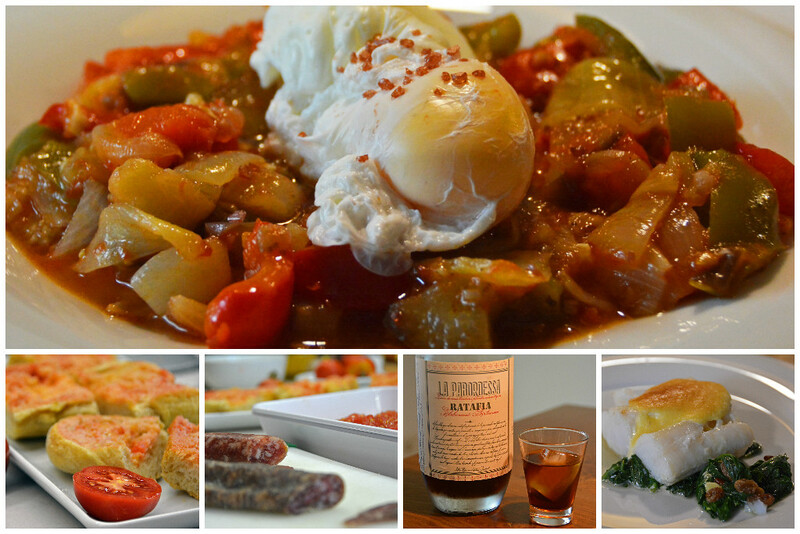 Locally known as Samfaina, we prepped and cooked the ingredients required to create what is known elsewhere as Ratatouille (with poached eggs). Fresh tomatoes, onions, eggplant, peppers, and garlic simmered in the pan dispersing the most pleasant aroma. As our main meal simmered, we enjoyed traditional Catalan tapas – tomato and olive-oil bread while preparing homemade garlic mayonnaise for our Cod au Gratin with Mousseline of garlic. 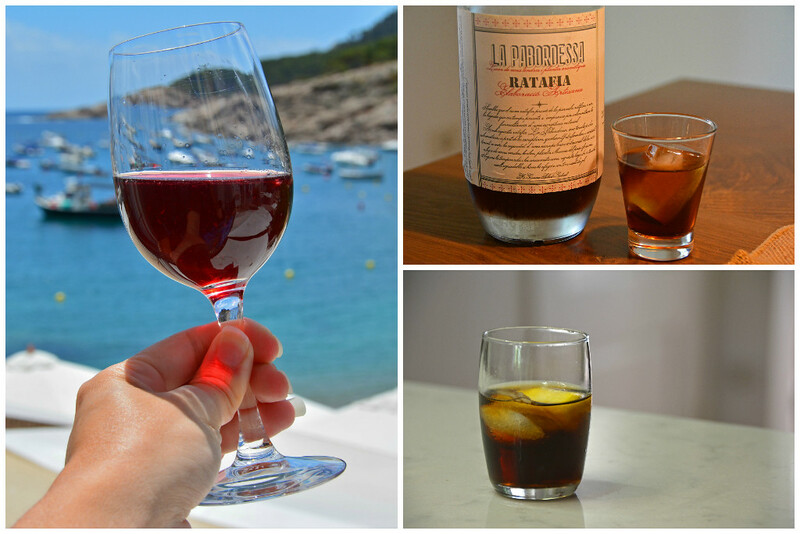 Sipping on local Ratafia and Vermouth also complimented our cooking experience. Participating in a cooking class truly allows you to immerse yourself in a culture, as you have the intimate opportunity to meet with locals and learn the history and tradition behind their cuisine. In 3 hours, we learned more about Catalan culture than we would have had we simply dined out in a local restaurant. So, when planning your visit to Costa Brava, please schedule in time to participate in a cooking class with Xavier at Tots a Taula in Girona. 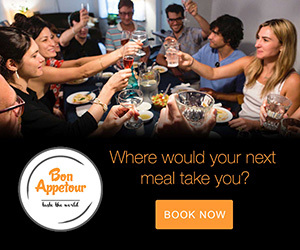 We guarantee you will leave feeling satisfied, educated, and well fed! 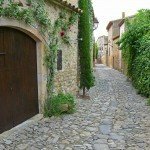 We absolutely adore visiting medieval towns. And as indicated by the subject matter of this post, we revel in sampling local cuisine. While the cooking class was awesome, sometimes it’s nice to let someone else do the cooking! During a visit to the medieval town of Pals, we stopped into Restaurant El Pedro, a traditional Catalan restaurant, for a delicious Catalan meal. Located in a picturesque Gothic setting surrounded by cobblestone streets and beautiful arches, the restaurant sets the stage for dining like royalty! Our multi-course meal consisted of roasted pepper with goat cheese and dried fruit, along with courgettes (zucchini) pie for starters. The four of us split a traditional rice with seafood entree as the main course. It was absolutely delicious and very hearty… the leftovers fed us for days! Our meal was made complete by delicious servings of torró (nougat) ice cream, ratafia, and caramelized walnuts, along with chocolate coulant and Bailey’s ice cream. Again, we walked away feeling full, satisfied, and well cultured! It isn’t just the local cuisine that brings people together, it’s also the spirits! We had our fair share of sangria during our relaxing time in Tamariu. There is no fixed Sangria recipe, but rather it consists of a little bit of this, a little bit of that: wine, chopped fruit, a sweetener, and maybe a little brandy. Thought to have been created during the 15th century in Spain, sangria is a drink enjoyed by locals and travelers alike, and is best served super chilled on a warm summer’s day! During our time in Costa Brava, we were graciously introduced to the local liqueur, ratafia, which is created with walnuts and a variety of herbs. Some variations of ratafia contain over 40 different herbs, including plants, flowers, fruits, spices, mint, lemongrass, and sage, for example. Matured for over two months before being decanted and aged in wooden casks, this deliciously sweet drink is either served as a digestive liqueur after a meal or as an aperitif or nightcap with ice. As we found out at El Pedro in Pals, it is also divine served over ice cream, making for a scrumptious ! While many Americans, like ourselves, only know vermouth (vermut in Catalan) as an ingredient for a classic martini, it is typical to enjoy as a standalone spirit in Catalonia, Spain. Catalan style vermut has notes of herbs and spices and is best enjoyed over ice with a citrus garnish. 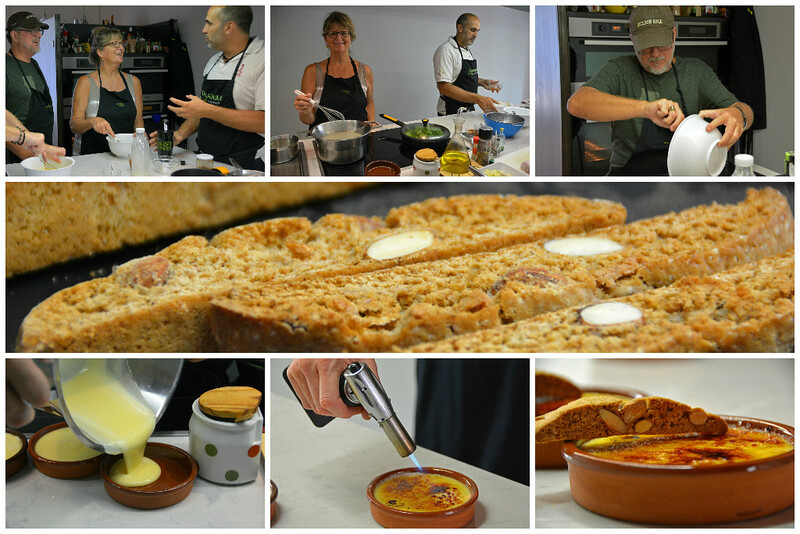 It was a great compliment to the Catalan cuisine we indulged in during our cooking class in Girona. Gin is another spirit favored in this thriving region of Spain. We drove for an hour and a half from Tamariu before reaching our destination- Masia Serra Winery in Cantallops, just a few kilometers south of the border of France. Once we arrived, a warm greeting from the vineyard owners, Jaume and Sílvia, in addition to the picturesque views of vineyards, lavender, and olive tree groves on their 13 hectare property made us completely forget the long drive. 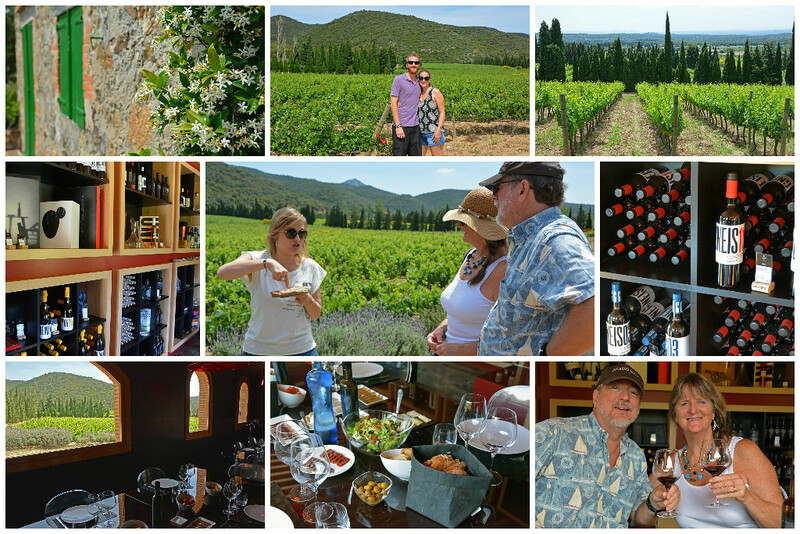 Sílvia took us on an informative guided tour around their family-owned vineyard, explaining the history of the winery and their vision for eventually hosting overnight guests on the vineyard property. The most fascinating part of our tour had to be when we visited the barrel room and came upon the “mother” barrel. This barrel dates back to 1860 and has never been empty. A small portion of its contents is used in the production of their INO wine, which is absolutely delicious. Once we got a taste of this sweet dessert blend, we simply had to purchase a bottle to go. If space was not an issue, we would’ve bought more! 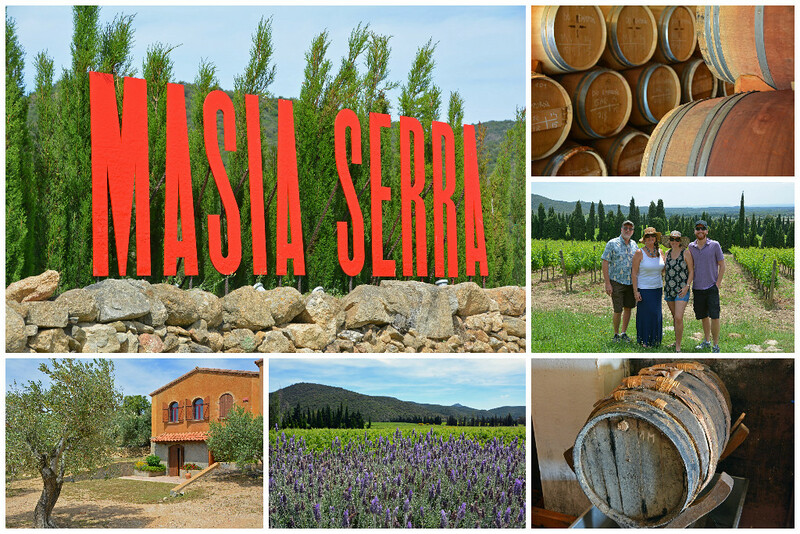 Each wine from Masia Serra we sampled was absolutely divine and complemented our lunch perfectly! 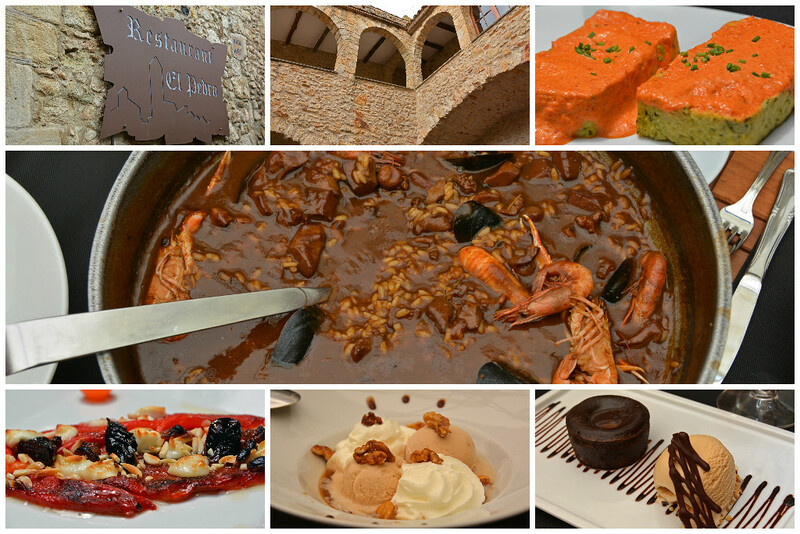 The wine alone is reason enough to visit Masia Serra, but the lunch we had took it to a whole new level of fantastic! The winery offers picnics among the vines, paired breakfasts, lunches and dinners, meetings and celebrations, intimate weddings, culinary workshops, and tasting courses to help you make the absolute most of your visit. 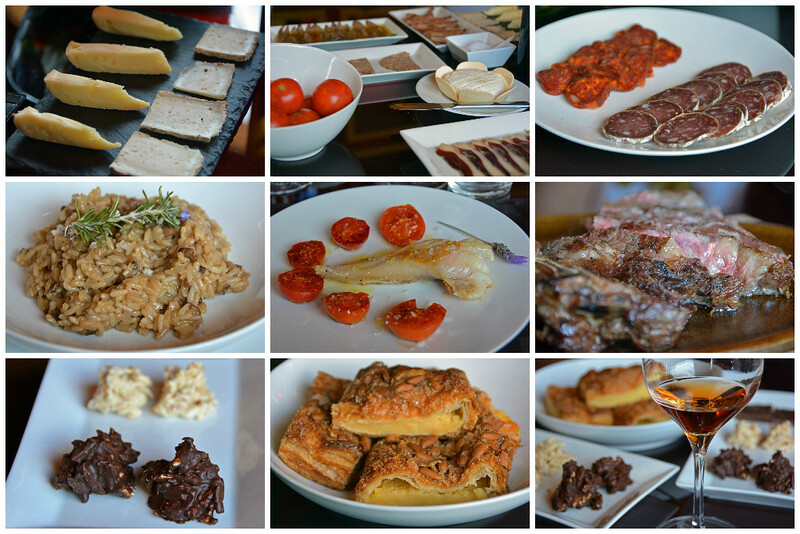 Their delicious variety of wines beautifully complement the delectable selection of traditional Catalan food. 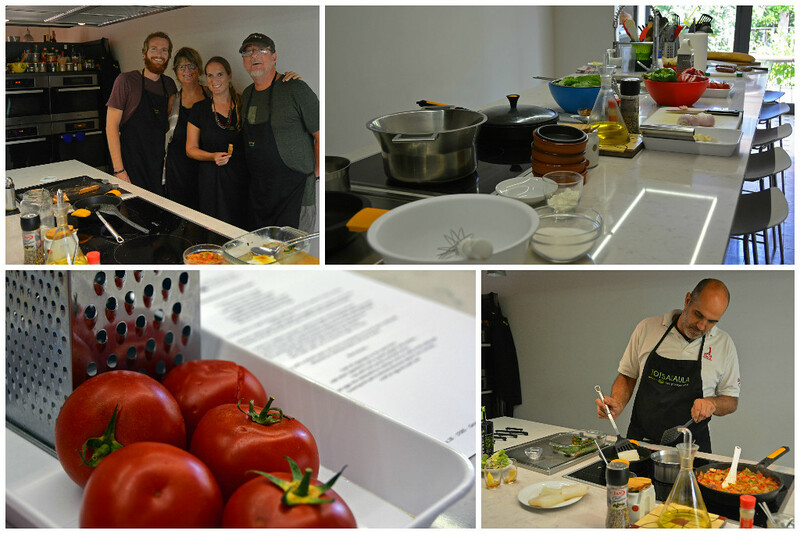 All of these activities (Catalan cooking class in Girona, traditional rice lunch in Pals, and winery visit in Cantallops) allowed us to get a flavor of Catalan cuisine and culture. 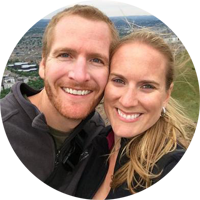 The Catalans we met during these experiences couldn’t have been more welcoming, gracious, and friendly. 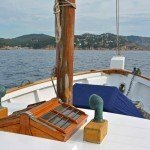 The memories we created during these activities are more invaluable than any souvenir we could’ve purchased during our visit to Costa Brava. Being able to bring home some Catalan recipes to try ourselves is yet another lasting and savory souvenir we’ll be able to enjoy time and time again. 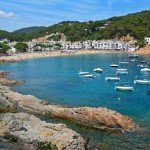 Before you go, be sure to take a look at some of the incredible activities available along the coast in Costa Brava, like kayaking, sailing, and hiking! We’d like to thank the Costa Brava Tourism Board (Patronat de Turisme Costa Brava Girona), Tots a Taula, Restaurant El Pedro, and Masia Serra Winery for their partnerships during our stay in Costa Brava. As always, our write-ups are an accurate representation of the experiences we had.